I love this picture, this evocative picture of Christ Church. Last month, when we joined together for a 24hr. 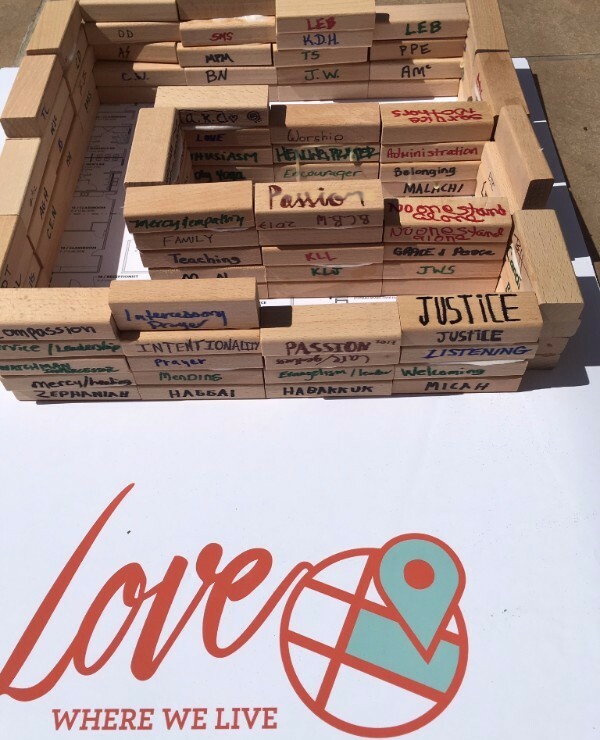 Prayer Vigil, we were invited to take a small block of wood and write on it the God-given abilities, passions, and contributions we bring to God’s ministry through Christ Church. Our parish is, quite literally, built up of people like you. The staff don’t build the church. We are a magnificent structure. You and I “like living stones are being built up as a spiritual house.” Jesus is the Cornerstone that joins together and aligns the rest of us for elegant integrity (1 Peter 2:5-7). Every single worshipper at Christ Church is an essential, exquisite, and unique stone in the church God is building for the sake of the world. That’s the architecture of mission. For the next several weeks I invite you to step into service, to give of your time and energy, to take your place in the household of God as a volunteer on mission with God. The gift of our time and energy is not just about “getting the job done”; it’s more importantly about living out our discipleship, being formed into the image of Christ, who laid down his life for all. Our service sometimes thrills, other times it’s quite mundane; always, always, it is a pleasing aroma to our Father. If you would like to hear about some ways to serve, you can let drew@christchurchofaustin.org know about it right now. He’d love to hear from you! And be sure to check out the Church Under the Bridge announcement below . . . an incredible opportunity to learn about the homeless (and how you can help Christ Church serve them) at one of the nation’s most innovative sites/efforts to address this issue.